I love Sundays! Not only do I get to go to church and recharge myself for the week, but it gives me an excuse to wear fun outfits! I found the cutest skirts by Leanne Barlow, through Instagram somehow (I think? ), and was so excited to finally wear the one I ordered! I'm obsessed. There are so many ways to dress these skirts up or down. I ordered red (typical), but I may need to invest in another color soon. Love them all! So what if I look like I'm going to a Christmas party? Red is a constant in my wardrobe no matter the season! Hope you all had a beautiful Sunday. Have a great week! The whole outfit is so cute! 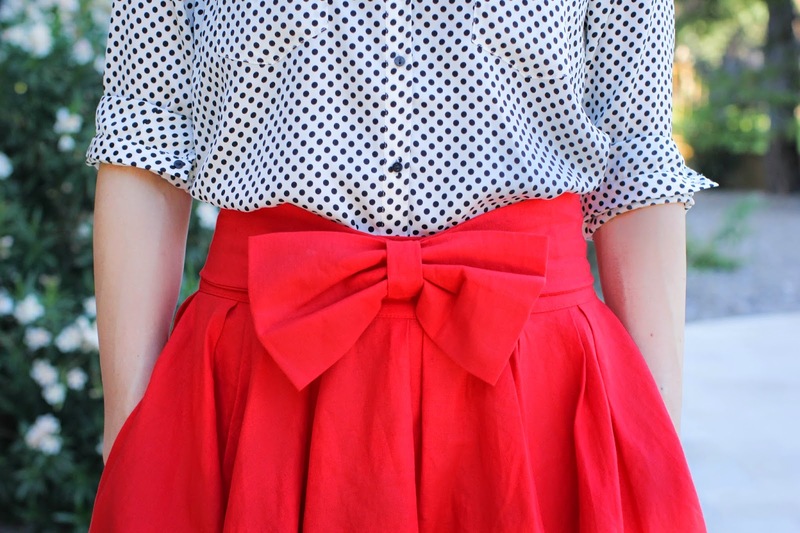 I saw a similar skirt at Express (sans the bow, which I love!) and had to put it on my Christmas list ASAP.